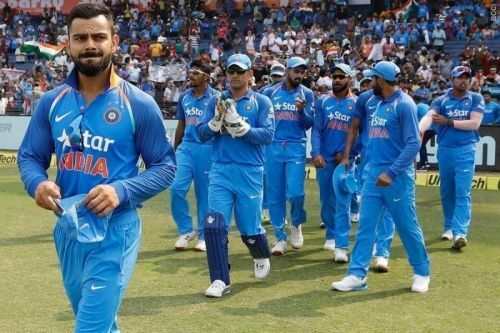 After several months of anticipation and fierce debate, the Board of Control for Cricket in India (BCCI) has finally announced the 15-man squad for the ICC World Cup 2019. The tournament is set to kick off from 30th May when the hosts England take on South Africa at the Oval. The selection of India's squad today was not based on IPL performances, according to the BCCI. Virat Kohli had made it clear in his earlier interviews that they were searching for the right balance in the Indian team and that IPL performances would not determine the final selection. Ambati Rayudu and Rishabh Pant faced the axe while Dinesh Karthik and Vijay Shankar have been picked for the mega event. The exclusion of Rayudu has raised many eyebrows as he has fourth-highest batting average (47.05) for India in ODI cricket after Virat Kohli(59.57), MS Dhoni (50.37) and Rohit Sharma (47.39). Although the decision seems a little harsh on Rayudu, his inconsistency in the recent ODI series led to his downfall. Meanwhile Pant, often called the heir to MSD’s throne, will have to wait for his debut World Cup appearance. He has been in good nick for the Delhi Capitals in the ongoing season IPL, but his wicketkeeping has been sluggish at times. Karthik keeps his place for being a reliable wicket-keeper batsman with the tendency to play unorthodox strokes at the back end of the innings. Vijay Shankar, another highly rated youngster, will provide the much-awaited balance to the Indian team as he can not only bat at number four but can also bowl some crucial middle overs. Most of the selections were predictable to be honest, but the burning question was whether India would go for a fourth seamer or another batsman. They eventually went for the latter and roped in Shankar in place of, potentially, Umesh Yadav or Siddarth Kaul. Dhawan and Rohit are likely to start the innings followed by Kohli, Shankar, Dhoni and Jadhav as the core batsmen. Hardik Pandya and Ravindra Jadeja will provide the all-round firepower while Jasprit Bumrah, Mohammed Shami and Kuldeep Yadav will be the frontline bowlers. The BCCI has put its best foot forward to name a team consisting of in-form players, with the right combination of talented youngsters and experienced campaigners. Now the onus is on the Indian players to deliver on the grandest stage of the cricketing world. In England and Wales, the temperament and resilience of the players will be tested over the two-month long tournament. The main concern for the team management will be the fitness of all their key players who are currently sweating it out in the IPL. With match-winners like Rohit, Kohli, Dhoni, Pandya and Bumrah in their ranks, the Indian team has the potential to go all the way in the World Cup. It remains to be seen if the English tracks will trouble them, or if Kohli and Co will rise against the odds to clinch the ultimate glory.